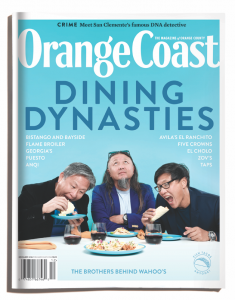 Dining Dynasties | Across multiple generations or among siblings, these O.C. restaurant owners make food their family’s business. Perfect Getaway | Head to Santa Barbara for the holidays. Hot Shop | Prism Boutique opens its first O.C. location at The Lab. Finds | Sparkle this season in glistening fabrics and accessories. At Home With… | HGTV star Israel Battres builds on his success in Santa Ana. My O.C. | In-person chats and front-seat Lyft rides, not posts online, promote true friendships. Rituals | Adopt A Family has helped bring joy to those in need for nearly 50 years.